Dental Implants Seattle: How Does Periodontal Charting Work? Your gums play a major role in your oral health by protecting the roots of your teeth and keeping bacteria away from the teeth. However, when gums become unhealthy, they may begin to pull away from the teeth, leaving room for food particles and bacteria to damage the teeth. Unhealthy gums are often the result of poor oral hygiene and can often be prevented. Periodontal charts, also known as gum charts, are used by dental professionals in order to gather information about your gums and determine if your gums have been damaged by periodontal disease or not. When your oral health specialist performs periodontal charting, they will do several measurements that will show whether your gums have moved. In a healthy mouth, pockets in the gums are usually two to three millimeters or less, whereas, in an unhealthy mouth, they are usually over five millimeters. Additionally, if there is any sign of bleeding, this is almost certainly a sign of gum disease. During a periodontal measurement procedure, your periodontist will use what’s called a ‘periodontal probe’ to insert in the area between the tooth and the gum. On the probe itself, there are lines like a ruler to indicate how deep the periodontal pocket is. Each tooth is typically measured six times; three areas on the front and three on the back. As the measurements are made, your periodontist will call them out to an assistant who will write them down and keep them in your dental health record. Let’s take a look at each measurement and see what they mean. 0-3mm: If you have no periodontal pocket or up to three-millimeter pockets, you’re probably doing well with your oral health. Although a small periodontal pocket is normal, if the gums bleed easily, this could be a sign of gingivitis. A professional cleaning and better at-home care will help reverse this. 3-5mm: With bleeding, a 3-5mm deep periodontal pocket is a sure sign of periodontal disease. You may need to set up several appointments with your periodontist to have the gums repaired and the teeth thoroughly cleaned. Even if there is no bleeding, your periodontist will likely recommend a thorough professional cleaning. 5-7mm: At this point, your periodontist will likely start to see both gum and bone tissue damage. Your risk of losing the tooth is much higher at this point and you may not be able to reverse the damage without surgery. 7mm or more: With this periodontal pocket depth, you’ve likely reached advanced periodontal disease. There will almost certainly be bleeding and your periodontist may recommend surgery or extraction of the tooth. 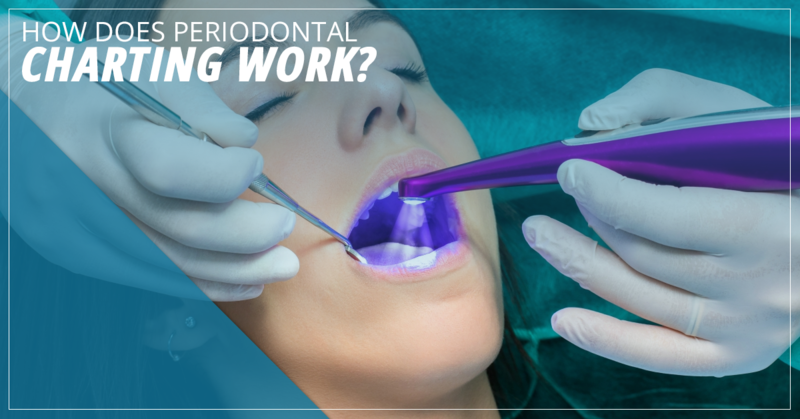 Periodontal charting is one of the most effective ways to determine the health of your gums. Although periodontal disease doesn’t progress at the same rate in every patient, measuring pocket depths and recording the information will give your periodontist a better understanding of your oral health. If there is cause for concern, your periodontist may have you come back and have the pockets measured again to see if any progress was made. Ultimately, this procedure will allow you and your periodontist to detect gingivitis in its early stages so that it can be reversed before reaching advanced periodontitis. Periodontal charting is just one of the tools your periodontist will use to better understand the health of your gums. If you notice that your gums are swollen, bleeding, or sensitive, your best course of action is to visit your local periodontist in Tukwila at Same Day Implants. Our highest priority is to provide you with an accurate diagnosis when it comes to your gum health and allow you to choose the best long-term option for you. However, the sooner you visit us for an appointment, the better chance you will have of saving your natural teeth. Give us a call today to get started.